For women who often have ‘bad hair day’ must understand how dry shampoo works as their life-saver. Well, I am a dry skin type of person and washing hair for every two days is supposed to be decent, but somehow my hair often get drenched easily, especially when I have day to night activity, traveling, or spend too many hours outside - plus the Surabaya’s weather that is incredibly hot these days. My hair will be looked so flat and greasy that makes it really hard to be styled. I know that I can just wash my hair but it will take much time to wash and wait until dry – while most of the times I don’t have enough time to do it, especially when I am in a rush. I realize that dry shampoo is the instant way to help me to solve the problem – but the fact is that I don’t really use dry shampoo because somehow I still can’t find the right one, that’s why when I got chance to try this Ellips Dry Shampoo from Beautynesia, I was beyond excited to try this and share with you guys immediately. So, let’s just get deeper into the review right now ! Ellips Dry Shampoo is the perfect instant solution for greasy hair because it’s instantly absorb excess oil from hair and scalp, instantly make hair smooth and volumized. It also gives perfect smell and fresh sensation. Comes with 4 variants : Blossom ( floral scent ), Fruity, Breeze ( fresh scent ), and Exotic ( tropical scent ). It also available in 2 sizes : 50 mL and 200mL. Shake the bottle carefully before applying. Spray the dry shampoo into hair and scalp from around 30 cm, then massage hair thoroughly with fingertips, and then style it. Light yet sturdy stainless steel bottle with 4 eye-catching colors depends on the variant. Description and instruction are written in Bahasa Indonesia. Spray works fine but it doesn’t come with seal. Clear powder form with pleasant yet strong scent. I’ve been using all variants of this dry shampoo ( Blossom, Fruity, Breeze, and Exotic ) for around two weeks and I can tell that it becomes one of must-bring item inside my bag. 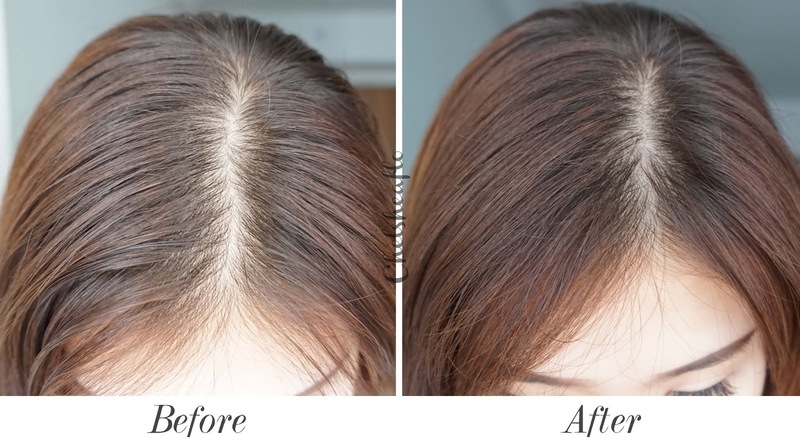 Since the first trying, I can feel that it’s really easy to apply, absorbs oil from hair and scalp for around a minute only while massaging the scalp slowly, and my hair is all set. From the picture above, you can see from the left picture my hair looks a bit wet and shiny because of the excess oil, then after applying the dry shampoo it looks more volumized and smooth. I have quite thin hair strands but this product doesn’t make my hair falls. What I like the most from this product is the pleasant scent that stays for very long time. The scent can stay for more than 8 hours and all of them are very fresh, it feels like you’ve just finished showering ! However, I have to re-apply this dry shampoo every 4-5 hours because after that my hair starts to greasy again. Overall, this Ellips Dry Shampoo has become my favorite to-go item because it literally helps me from bad hair day. I can be in wherever, do whatever I want to do ever since I use this dry shampoo because I only need a minute to get back my #HairReady and it is very efficient since I have pretty tight schedule as fashion designer and blogger. Although I like most of the variants, but if I have to pick one, I would choose Blossom because of the sweet scent that lasts for long time. I do really recommend this scent for those who likes floral scent, while fruity and exotic are for those who likes strong, bold scent – and breeze is for those who likes fresh, delight scent. Anyway, if you guys want to try this product, you can actually find it anywhere either online or offline store like cosmetic store, drug store, hypermarket, or e-commerce website ( Lazada, etc ).